The last DVD I reviewed was also from Arthaus, an unusual combination of Mahler’s 2nd Symphony in concert plus a visual ‘realisation’ of the score. It’s certainly a novel idea, although I’m not quite sure who it’s aimed at; seasoned Mahlerians would probably just want the symphony served straight but I suppose there might be some to whom the visuals will appeal. Quite honestly I can’t imagine the ‘realisation’ could sustain more than a single viewing but then the concert – with Semyon Bychkov and his Köln band – isn’t particularly inspiring either. 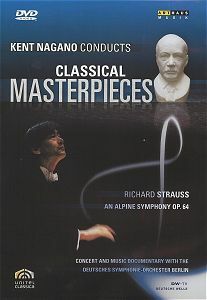 Innovative as always Arthaus have now embarked on a new series, ‘Kent Nagano Conducts Great Masterpieces’. Not the catchiest of titles but the works include mainstream classics, such as Bruckner’s 8th, Mozart’s Jupiter and Beethoven’s Eroica. As part of their ‘modern visual perspective’ Arthaus have added animated sequences to the rehearsal and documentary footage. Again I’m not sure of the rationale behind these ‘extras’ other than as an attempt to draw in a new television-oriented audience. Perhaps the booklet reference to ‘star conductor’ Nagano says it all. Eine Alpensinfonie, Strauss’s trek up a mountain and down again, must be one of his most splendid works, a wide-screen ramble strewn with exotic instruments, including thunderclaps and a wind machine. It’s the kind of extravagant project that only Strauss could bring off with any success, although I wonder if he ever regretted writing tosh like the Symphonia Domestica - probably not. The orchestra arrayed on the stage at the Philharmonie is quite a sight, some 130 musicians in all. ‘Night’ is wonderfully sonorous and weighty, although the extreme close-ups of brass bells and violin bows – achieved with remote-controlled cameras –take some getting used to. As the music builds to ‘Sunrise’ these macro views give way to an extended shot of Nagano’s hands goading the orchestra into that glorious blaze of sound. Visual gimmicks notwithstanding, this is shaping up to be a memorable performance, with resplendent brass and a real sense of drama. The overhead cameras tracking above the orchestra certainly provide an unusual view of the musicians and add an appropriate sense of omniscience to the proceedings. The distant brass in ‘The Ascent’ are thrillingly caught, the sound - in PCM mode at least - wonderfully burnished. It’s all very impressive and a vast improvement on the sonics of Bychkov’s Mahler 2. ‘Entering the forest’ brings more conventional views of the orchestra but thankfully the shots are carefully chosen so you can actually hear the instrument(s) you see. So often in filmed concerts we are treated to vaguely comical shots of cellists sawing away, apparently in silence, which is so distracting. It’s not only the choice of shot that must be commended here but also the cutting, which makes for wonderfully fluid – and fluent – visuals. Musically this performance just gets better and better, with some superb attack in those great string tunes and glittering torrents of sound in ‘By the waterfall’. This rare combination of good sound and visuals really is a treat and makes the whole experience much more engrossing. And just listen to those scurrying pizzicato strings in the meadows and the atmospheric horns of the Alpine pasture, not to mention those noble, echt-Straussian tunes that bind it all together. When we do see the conductor there is no Karajan-like narcissism, just a clearly visible beat and an economy of gesture that’s a pleasure to watch. It seems quite extraordinary that Nagano abandoned this work for 15 years because he was dissatisfied with his performance of it. This is clearly a man very much in control of the music, coaxing committed and visceral playing from his band. The rough rasp of tubas comes across very well as our intrepid walker plunges into the undergrowth, flailing among the thickets before emerging on to the glacier with a superb thunder of timps. The ‘Precarious moments’ are nicely articulated, with a rising sense of anticipation in those trumpet figures and flare of trombones. Of course ‘The summit’ marks the literal and philosophical peak of this work, so it’s not surprising that Nagano looks like he’s had an arduous climb. There is some lovely clarinet playing just before that great outburst. And what a stupendous view from the top; indeed, I cannot remember a performance – live or otherwise – that offer such a satisfying combination of orchestral blend, weight and clarity at this crucial point. It’s may be downhill from here but Strauss keeps up the invention and impetus all the way. In terms of string tone the band yields nothing to its rivals in the Berlin Philharmoniker, such is the power and precision of their playing. In ‘Vision’ we cut to soft-focus shots of the Philharmonie lights, as if our walker is in a momentary daze. And as the sun dims the lights appear again as stars in the night sky. This may seem contrived but it’s a visual conceit that actually works rather well. After all this elation and the thrilling impact of the organ the reflective ‘Elegy’ comes as a welcome relief. Those rumbling tubas are never far away, but Nagano keeps them in check with an admonishing finger. Once again I was struck by the excellent balance, the clarinet and organ both clearly audible without resorting to artificial highlighting. Ditto the clarinet and timps in ‘Calm before the storm’. But just when you think it’s all over Nagano hurls the orchestra into a fearsome storm. I simply cannot recall it sounding so terrifying. The nay-sayers will probably blench at this point but I defy anyone not to be swept up in the tumult. And how could one not respond to that thrilling tune as the sun sets, underpinned by the organ? Not since the early digital CD from Karajan and the Berliner Philharmoniker has this sounded more overwhelming. We get a brief glimpse of a bust of Strauss, who would surely have approved of this mighty reading, but he keeps some of his most serene music for the end. ‘Night’ has seldom fallen so quietly or darkness seemed so peaceful A deeply moving end to an extraordinary concert –and judging by the cheers and applause the audience thought so too. The rest of the disc is taken up with nearly an hour of ‘extras’, including a promotional trailer for the other discs in the series, a piece on Strauss’s music for the waterfall and an extended rehearsal segment. In the latter Nagano talks briefly about the score’s philosophical subtext and there are several clips of him rehearsing individual sections of the orchestra. To be honest there is very little of real interest here and any insights are soon forgotten in a welter of excerpts from the performance itself. You either like these add-ons or you don’t, and I have to say I rarely find them illuminating. There is little here that a quick Google or a look at Wikipedia can’t provide - if you’re a newbie, that is - and nothing at all if you already know the piece. It’s all very slickly produced, with sophisticated graphics and animated clips, but really it’s the music that counts – and that’s where this package really scores. Second-rate music this may be but I doubt it’s likely to get a more persuasive performance or recording than this. As someone who is less than enthusiastic about filmed concerts this is far and away the most enjoyable one I have ever watched. The sound is excellent and the picture pin sharp on both a PC and via an upscaling DVD player. The notes are adequate and the disc is generously cued. Essential viewing for all Straussians.